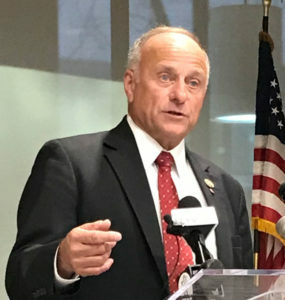 Republican Congressman Steve King is disputing his Democratic opponent J.D. Scholten’s assertion that King’s views on many issues, including immigration, are out-of-step with fourth district voters. Earlier today, Scholten said King’s stand on immigration is “10 miles down the road” from most Democrats and Republicans. And King — who has sponsored bills in congress to end “birthright citizenship” — points to Trump’s recent comment that he’d issue an executive order to end citizenship for babies born to parents who are in the country illegally. Scholten also has said the VISA guest worker program must be revamped so businesses, like the pork processing plants in northwest Iowa, can hire more workers. King said the border must be secured before those kind of immigration-related issues are discussed in congress. King said his own evaluation indicates there are more than 100 million people already here who could or should be working. King, who is recovering from laryngitis, spoke by phone with Radio Iowa this afternoon.